Paleontologists have discovered a rich array of exceptionally preserved fossils of marine animals that lived between 480 million and 472 million years ago, during the early part of a period known as the Ordovician. The specimens are the oldest yet discovered soft-bodied fossils from the Ordovician, a period marked by intense biodiversification. The findings, which appear in the May 13 issue of the journal Nature, greatly expand our understanding of the sea creatures and ecosystems that existed at a crucial point in evolutionary history, when most of the animal life on the planet was found in the oceans. The team—led by Peter Van Roy, a Yale postdoctoral associate, and Derek Briggs, the Frederick William Beinecke Professor of Geology & Geophysics and director of the Yale Peabody Museum of Natural History—uncovered more than 1,500 fossils of soft-bodied marine animals in newly discovered sites in southeastern Morocco during a field expedition last year. Many are complete fossils, and include sponges, annelid worms, mollusks and horseshoe crabs—in particular, a species similar to today’s horseshoe crab, which appeared some 30 million years earlier than previously known. The Cambrian period, known for the “Cambrian Explosion” that saw the sudden appearance of all the major animal groups and the establishment of complex ecosystems, was followed by the “Great Ordovician Biodiversification Event,” when the number of marine animal genera increased exponentially over a period of 25 million years. Because hard shells fossilize and are preserved more readily than soft tissue, scientists had an incomplete and biased view of the marine life that existed during the Ordovician period until now. The site in Morocco where the fossils were discovered was conducive to preserving even the soft tissues of the creatures that lived in its waters so long ago, thanks to generally calm waters, occasional rapid burial that protected the animals from scavengers, and favorable chemical conditions within the sediment that allowed for the rapid mineralization of soft tissue as it decayed. 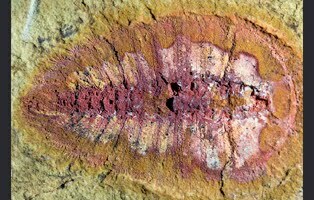 In addition to providing a more complete understanding of marine life at that time, the team’s discovery upends a long-held belief that so-called Burgess Shale-type faunas, which are typical for the Early to Middle Cambrian, disappeared at the end of the Middle Cambrian epoch, some 499 million years ago. “There was an anomaly in the fossil record. Most of these animals just seemed to disappear at the end of the Middle Cambrian,” said Van Roy, first author of the paper. The team found that these Burgess Shale-type species survived well into the Ordovician period, which would have had a major impact on those ecosystems and their evolution, Van Roy said.